Even those who have never read Cervantes know about him. Even Shakespeare seemingly knew about Cervantes, but whether Cervantes ever knew of Shakespeare, we cannot say. Like Shakespeare, Cervantes was a writer of poetry, drama, and, of course, the father of the modern novel, an accomplishment, which even Shakespeare, could not equal. As a poet, Cervantes is less than promising, as a dramatist, maybe somewhat respectable, but as a novelist, he emerges unequalled and, perhaps, even unexcelled. It was through the novel with its striking narrative power, its use of dialogue, and its insightful metaphor that Cervantes forever achieved the literary recognition that has followed him as much as the realistic Sancho Panza, has followed the idealistic Don Quixote in the quest for adventure and understanding. Even the notable Dostoyevsky acknowledged the impact of Cervantes, calling El ingenioso hidalgo don Quijote de la Mancha “the ultimate and most sublime word of human thinking.” Clearly, the basis of Dostoyevksy’s novel, The Idiot, was Don Quixote. And yet, we know so very little about Cervantes, even less about his early years. 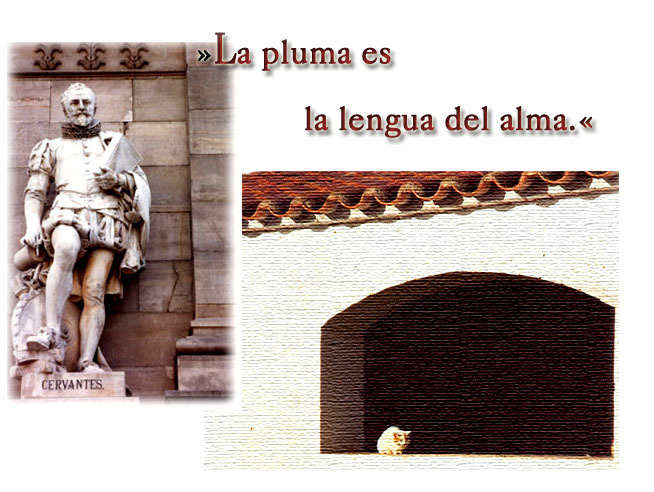 Born in Alcazar de San Juan, Spain on September 24, 1547, Cervantes spent his childhood living in several small towns. His father, Rodgrigo de Cervantes, was a surgeon, going from one small town to another apparently in search of work. His mother was a woman named Leonor de Cortinas, and may have been a Jewish convert to Christianity. We do know, however, that young Cervantes went to Italy around 1569 as part of Cardinal Acquaviva’s retinue, and it was probably here in Italy that Cervantes came in contact with Italian literature with its expressive style and ornate chivalric focus. In 1571 he fought at the decisive naval Battle of Lepanto. Wounded in battle by a harquebus shot, his left hand, however, remained maimed for the rest of his life. Yet, Cervantes often spoke of the wound to his hand and forehead. Later, on a subsequent campaign Cervantes fought in north Africa against Moslem corsairs. But while aboard ship on a return trip to Spain in 1575, he was captured by Turkish forces and sold into slavery in Algiers. For the next five years, he lived and suffered as a slave. Having attempted to escape at least four times, Cervantes was finally ransomed by Juan Gil for the sum of 500 ducats. He returned to Madrid, worked both as a purveyor for the Spanish Armada and later as a tax collector. For most of his life, Cervantes lived in poverty, but the release of Don Quixote, a notion if we can understand the opening words in a literary sense, came to him while Cervantes was imprisoned as a debtor at Argamasilla in Sevilla. His only child, a daughter named Priscilla, was born as a result of a liaison with Ana de Villafranca. In 1584 Cervantes married Catalina de Salazar y Palacios, a woman some 22 years younger than he. Cervantes died on April 23, 1616, three days before writing the dedication for his final literary work, Persiles. Even though Persiles was his last work, it never equaled neither the tone nor scope of Don Quixote. Surprisingly, Unamuno disdained Cervantes but praised Don Quixote as somewhow excelling Cervantes’ literary ability. Perhaps, the most intriguing question, though, is the one raised by Ortega Y Gasset— “Is Cervantes joking? And what is he making fun of?” Don Quixote defies simple explanations, but its humor and delight remain as inexplicable as its depth.